Wind chimes with hummingbirds are the newest addition in my growing collection of hummingbird yard art. Which is kind of ironic in that I often say I’m not a collection kind of person. Yet I really love hummingbirds and have discovered I have a weakness for unique garden decor that features hummingbirds. So wind chimes with hummingbirds it is! I didn’t choose my Wind Chimes with Hummingbirds. They chose me as they were a gift. That said, I don’t think I would have selected anything different. I love everything about my hummingbird wind chimes. From the delicate, melodic tune of the chimes to the hummingbird perched on the top. This hummingbird wind chime is just right. These outdoor hummingbird wind chimes are created by Woodstock Chimes and have the best quality sound of all the wind chimes I have in my garden. You can actually listen to the chimes by going here! In additional to sounding so awesome, they are gorgeous as well. The chimes are bronze and are squared instead of tubular creating a uniqueness for these hummingbird wind chimes. The hummingbird perched on top as well as the wind catcher below is an eye catching, vintage looking verdigris. They have a lovely greenish blue patina that makes for a unique piece of garden art. The contrast between the bronze chimes and the verdigris is so appealing and blends well with my other Hummingbird Yard Art. The hummingbird at the top of the wind chime is crafted so the hummingbird turns and spins slightly as the wind moves the chime. There are little beads that hold him in place. It’s so pretty when he is moving with the breeze. 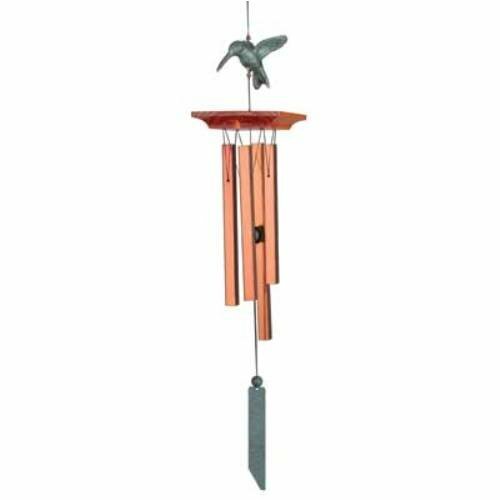 These Wind Chimes with Hummingbirds are the perfect size, about 25″ in overall length. This gives you the option of displaying them in multiple locations instead of being limited to a high “perch” for them. I am all about moving my garden decor around often as the seasons as well as my moods change. You can hang these from a plant hanger, from a fence or wall, up high from a tree branch or even lower from a short Shepard’s hook. Every location they are placed creates a different wind flow, so the sound of the chimes changes as well! Need More Hummingbird Wind Chime Ideas? I Can Help With That! When it comes to garden decor, I always try to think about the year round effect. You get more for your money by selecting garden decor that functions year round. creative garden decor, Garden Art, Garden Decor, Garden Decor Gift Ideas, Garden Wind Chimes, hummingbird wind chimes, Hummingbird yard art, Unique Garden Decor, Wind Chimes, Wind Chimes for the Garden, Wind Chimes with Hummingbirds.